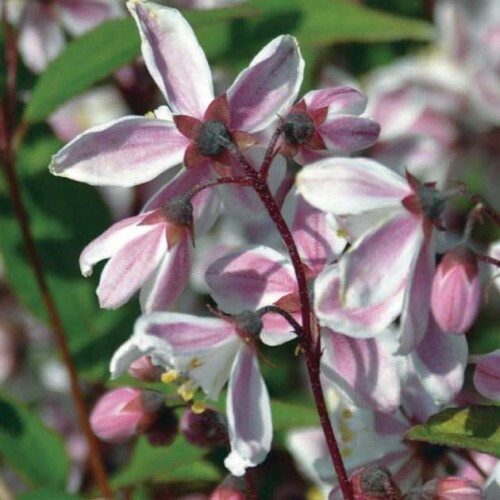 'Nikko Blush' is a lovely woodland shrub that when planted in a sunnier location, will produce an abundance of soft pink, lightly fragrant blooms on arching stems. Its lightly fragrant flowers appear in late spring/early summer. Plant a few for a low growing hedge, you will love the shades of burgundy it displays in the fall. 'Nikko Blush' can be used as a flowering groundcover, massed on a wall or terrace, in the front of a shrub border, as a low-growing hedge. It also does well as a container plant and transplants readily. Prune to rejuvenate or shape as needed.